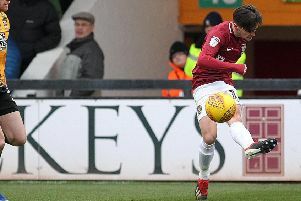 Chris Wilder has issued a swift and emphatic response to John-Joe O’Toole’s plea to be handed more match time at Sixfields. And the Cobblers boss isn’t pulling any punches, suggesting the player needs to look a little closer to home for reasons why his game time has been limited this season, rather than question him as the manager. O’Toole was placed on the transfer list by Wilder in May after a disappointing first season with Northampton, and he remains on that list today, although he is in line to keep his place in the Town team for Saturday’s trip to Wycombe Wanderers. In the wake of his impressive goalscoring return to the starting line-up in Tuesday’s 1-1 draw at AFC Wimbledon - his second goal in two starts this season - O’Toole said: “The manager has told me I’m not in his plans, but I feel I’m at an age where I need to play and I feel like I should be playing. “But if you’re not in the manager’s plans you’re looking elsewhere. I’m really disappointed. “Obviously everyone knows last season didn’t go too well for one reason or another but this year I’ve felt a lot sharper and I feel like that, when I do play, I’m going to do a much better job than last year. I put him in the team on Tuesday, he didn’t put himself in the team, I put him in because I felt it was right for Northampton Town Football Club, it wasn’t about Chris Wilder or John-Joe O’Toole. It was about the football club getting a good result, and we have a player getting paid really good wages that has underperformed. “It has been so frustrating but you just don’t know what’s going to happen or what’s around the corner in football. Wilder is happy for O’Toole to have his say and voice his opinion and there will be comeback on that, but the Town boss made it clear that the player has caused many of his own problems since signing for the club in the summer of 2014. When asked if his mind can be changed on O’Toole, Wilder said: “Play for the football club, be a good player. “Look after yourself, be a good trainer, be a good player, be a good footballer. “I didn’t bring him (O’Toole) into the football club to sit him in the stands, but he had a poor season last season. “Footballers need to look at themselves, don’t look for excuses and look to say ‘I’ve been played in the wrong position’, or this that and the other, although it is a combination of things and I understand that. “We have to get the best out of him, but the player has to look at himself first. “I am not an idiot, I have managed a lot of football clubs, and have managed a lot of games, and if you’re playing well, and doing well in training, it gives me an unbelievably tough decision to make to leave you out. “There are no shoo-ins in our football team, there can’t be, and the only way you can get in is to play consistently well, week in, week out, and you do the right things on the pitch, and the right things off the pitch. “If you do that it makes it unbelievably impossible for a manager, and there are no personalities involved here. “I like John-Joe, I think he is a decent kid, and he knows I am a decent fella, and I think if you ask people in football they will tell you I am an honest guy. “I work hard, give honest answers to the media and to players, and it is tough sometimes, but that is the way I roll. “We felt we got a good footballer coming into the building last year, and he didn’t have a good season, no matter how you dress it up. “The proof is in the pudding, in that nobody has been in for him. “If he had been ripping it up, then my door would have been knocked down with people asking for him, and it hasn’t been, so John-Joe has a decision to make. “He has to look after himself off the pitch, work extremely hard, which I have seen him do and he has done that better, and when he gets an opportunity, then play well. “He played well on Tuesday, and I am the first to pat him on the back. “I put him in the team on Tuesday, he didn’t put himself in the team, I put him in because I felt it was right for Northampton Town Football Club, it wasn’t about Chris Wilder or John-Joe O’Toole. “It was about the football club getting a good result, and we have a player getting paid really good wages that has underperformed. “But if he performs, and he does well, and lives his life right, works hard in training, and does all the good things that good footballers do, on and off the pitch, then we have a player on our hands, and he will play. And when asked about the management style in handling O’Toole, Wilder added: “Why is it about me managing him? “I have done everything with him (O’Toole), and I shouldn’t have to tell players what they have to do when they have a bad game. “If we have a bad game, I don’t tell everybody ‘you’re all out the door and we’re going to get 19 or 20 players in’, look at yourself first. “He has been around the block and knows the situation, and this is a good club to play for. “The supporters at this club want John-Joe to do well, and I want John-Joe to do well, but it ultimately at the door of John-Joe and how he goes about it.